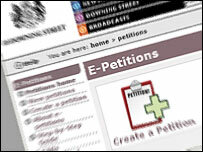 BBC NEWS | UK | UK Politics | E-petitions: Godsend or gimmick? The Downing Street website was once a rather sedate corner of the internet, mainly devoted to guided tours of Number 10 and lengthy reports of official briefings. But over the past year it has found itself in the eye of a political storm. A new service allowing citizens to submit petitions to the prime minister has taken off in a way nobody - least of all those in Downing Street in charge of running it - expected. More than three million people - or about 7% of the British population - have now signed petitions on subjects ranging from inheritance tax to calls for Spandau Ballet's Gold to be made the national anthem. 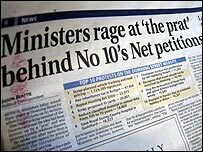 One petition - calling for an end to road pricing trials - was famously signed by 1.8 million people. But with the project approaching its first birthday, some are asking if - rather than providing British citizens with a powerful new voice - it has all been a waste of time. Professor Stephen Coleman, of Leeds University, one of the UK's most influential advocates of e-democracy, believes the site may be guilty of raising expectations it cannot fulfil. What exactly happened to these e-petitions once they arrived inside the belly of the beast. Which minister looked at them? "I think it's a combination of technological enthusiasm and a lack of any political connection," he told the e-Democracy 07 conference in London. "What exactly happened to these e-petitions once they arrived inside the belly of the beast. Which minister looked at them? Which members of Parliament looked at them?" Prof Coleman is, it must be said, pretty sceptical about many of the claims made for e-democracy in recent years. In the same speech, he attacked "spurious" online consultation exercises, TV phone-in contest rip-offs and even local councillors' blogs that receive "pitifully few responses from the general public" (far better, he argues, for politicians to join existing online debates). He conceded that the Downing Street site has been the most high-profile e-democracy project over the past 12 months. But until some research is done into who is using it and what influence, if any, it has had on political decisions, it will remain nothing more than a "gimmick," he says. Not surprisingly, Jimmy Leach, Downing Street's head of digital communication, took a different view. 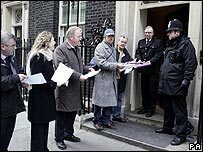 Online petitions were never meant to revolutionise democracy, he argued, but simply offer a digital alternative to the traditional trudge up Downing Street with a box full of signatures. People often complain that their "constitutional rights" are being violated when their petitions are rejected, said Mr Leach, but petitions do not currently have a place in the British constitution. "It does raise expectations and mislead people as to the role of petitions in the constitution," he told the e-Democracy 07 conference. "We haven't got the power to tell Parliament what to do." Unlike in Scotland, where MSPs debate subjects raised by online petitions, MPs at Westminster can simply ignore them. "There is no direct line - there never has been - from a petition to a debate in the House of Commons or the House of Lords. That may change but that's where we are and I think it's important to recognise that," said Mr Leach. But, he argued, "at least, unlike the old mechanism, it does make it possible to create a dialogue, however limited, with the users and citizens". What about the fact that nearly half of the 30,000 petitions submitted so far to the Downing Street site have been rejected? "Some people find it shocking that we reject quite such a lot, but as somebody who has read them all, I would actually argue the opposite," Mr Leach told the conference. "Despite what people do think, we do take quite a liberal attitude to acceptance but duplication is the biggest issue." There were also legal issues with some petitions, while others were offensive or "just trying to be funny". "It's not up to the prime minister when Doctor Who is scheduled on a Saturday night," said Mr Leach. But, he argued, the fact that any petition receiving more than 200 signatures will get a reply has made a real difference to accountability. Another issue was trust - with some people simply not believing the replies they received from government, said Mr Leach. One the whole, he concluded, the site "had its uses, it's had an impact but it is a limited example of listening and engagement. It shouldn't - and it won't - be the only solution preferred by government". The Conservatives have proposed allowing e-petitions to be debated in Parliament - and there are moves in this direction from the Commons modernisation committee. But progress - as with everything in Parliament - is slow. What the people behind the Downing Street site would really like - as Tom Steinberg of online democracy organisation MySociety made clear in his speech - is to allow people signing petitions to debate them online, maybe even with the relevant ministers and officials. But at the moment they do not have the resources to set up and moderate an online forum on the Downing Street site. And although some experts, such as Stephen Coleman, argue that politicians must learn to trust the public if e-democracy is ever going to flourish, allowing unmoderated comments to appear on the Downing Street site is probably not a realistic option at this stage. It is not hard to imagine the reaction of the prime minister - or any senior politician - to being called offensive names on their own website. And judging from the reported content of some of the petitions rejected by the Downing Street site, there is little doubt that that would happen. The dead-tree press - as bloggers call the newspapers - would no doubt have a field day. Add your comments to this story using the form below. Although they say they respond to all petitions with more than 200 signatures, the content of those responses leaves something to be desired. Commonly, the responses consist of nothing more than a cut-and-pasted statement of government policy. Disappointingly, on some occasions the answer does not even relate to the issue raised by the petition at all. This simply gives the impression that no-one bothered to read it before answering it. I suspect that the petition responses have done little but confirm to the public that no-one is listening. I have signed a number of these petitions, but have become somewhat disillusioned, since the only thing that seems to happen is that you receive an email effectively saying "Nanny knows best" and whatever it was you were objecting to goes ahead anyway. Even if millions of people also sign.